Look & feel great with our extensive skin care and beauty treatments. We offer Anti-Aging, Laser Treatments, Non-surgical Facelifts, ReFirme Skin Tightening, Foto Facials, Laser Hair Removal, Botox, Juvederm & more! Come relax in our spa-like office setting & SEE the world with crystal clear vision! Optimizing our patients' oral health in a luxurious environment while unmatched value is delivered by our team of highly skilled and trusted dental professionals. Rice Dentistry in Irvine California has provided some of the best in class cosmetic dentistry for over three decades. Dr. Scott Rice is a trusted and well respected member of several dental societies among them are the American Dental Association and the Pacific Aesthetic Continuum. As a cosmetic dentist he provides porcelain veneers, dental bridges, dental crowns, Strickland Facelift Dentures, sedation dentistry, Invisalign orthodontics, teeth whitening, routine cleanings for preventative dentistry. View our website for some amazing before and after pictures and testimonials. Online store based in Newport Beach. Many brands available including Irregular Choice Shoes, Dollhouse Footwear, Groove, Steve Madden. Products includes women's shoes, wedges, pumps, sandals, boots and more. The Victory Collection creates beautiful unique items such as necklaces, rings, bracelets and pendants. All pieces reflect timeless vintage and modern styles. From hand crafted features to elegant wiring and beading. Designs by a local artist who has learned to intertwine her knowledge of craft into her new love for jewelry making. 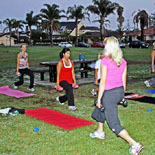 Total Training by Tammy's Fitness Boot Camp classes are an ideal way to get an amazing workout, in a beautiful setting, at an affordable price. Their Boot Camp is perfect for anybody looking to lose weight, gain lean muscle, or tone up. Classes are 60-minutes in length and consist of a mixture of cardio, strength training, circuit training, and FUN. Renaissance ClubSport offers a fresh energetic environment that will inspire you to reshape the way you work out. With a variety of classes, sports and fitness programs, innovative equipment, and social events, Renaissance ClubSport will keep you connected, and motivated. Our state-of-the-art Aliso Viejo fitness center also includes an NCAA gymnasium, a mixed martial arts, boxing and functional fitness training studio, lap and exercise pools, court sport programs, nationally-certified personal trainers, and a spectacular childcare facility. Renaissance ClubSport inspires healthy lifestyles. Call for a free fitness pass-(949) 596-4522. Full service hair and nail salon located in the heart of historic San Juan Capistrano. At Salon Gregorie's, staying current with the latest trends is always a priority. They recognize that each individual is unique and their experience technicians are experts at creating a style just for you. Also offering nails services - a warm radiant neck pillow will soothe your neck and shoulders while our expert staff provides an unforgettable natural nail manicure and/or pedicure. Make Services include: Mineral make up applications, and permanent make up beauty enhancement using natural colors, eyebrow and eyelash tint and perm. For complimentary consultation please call Shila @ 949-646-6675. Clear vision at the speed of light! LASIK Eye Surgery and other Laser Vision Correction procedures have revolutionized vision care. Over 40,000 eyes have been entrusted to the care of Dr. Alexandra Chebil, M.D., at Lasik Center Medical Group where we provide world-class vision care & laser vision correction with a goal to deliver excellent service & unparalleled results in a professional, friendly atmosphere. Our greatest thrill is to see the smile on our patient's faces the day after their procedure when they come into the office without their glasses & can finally see 20/20!